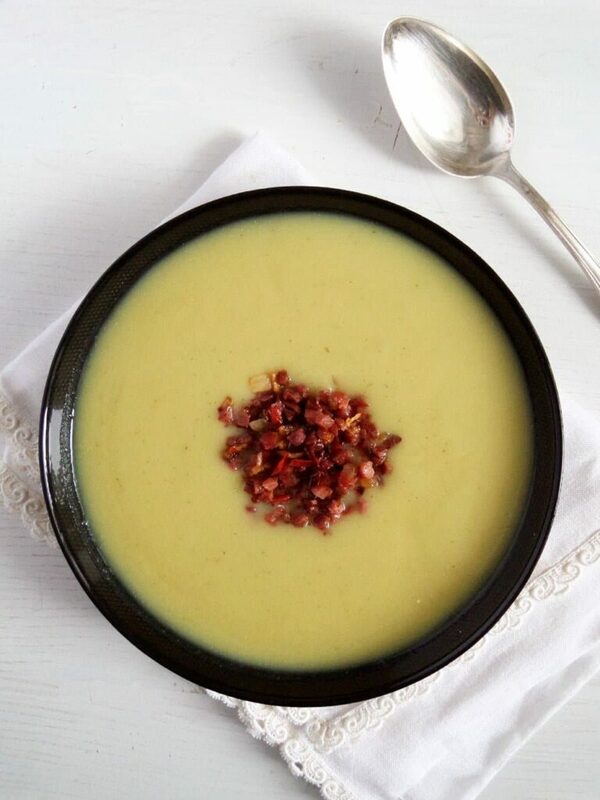 A creamy sunchoke or Jerusalem artichoke soup with a hearty salty and hot topping with bacon and sambal oelek, this is the perfect autumn soup! Sunchokes! Or Jerusalmen artichokes. You might be wondering what they are? I know I did the first time I heard the German word for it: Topinambur. A really twisted name, very un-German, I really could not imagine what that might be. But I was curious, as I always am when food is involved. So I found out that the sunchokes or Jerusalem artichokes (another strange name if you ask me, coming actually from the Italian girasole articiocco and having nothing to do with Jerusalem) or sunroot is a tuber belonging to the same species as the sunflower (thank you Wikipedia). Original apparently from Mexico, sunchokes found their way to Europe (France) at the beginning of the 17th century. They are still grown all around Europe today, but unfortunately not as much as to make them a widely available vegetable. It took me some years after first hearing of a sunchoke to finally be able to buy it around here. Not to mention that it is quite pricey as well. I wish I knew some of this people, so I could cook this Jerusalem artichoke soup more often. Or other recipes using the sunchokes. I have to say that I have only had the sunchokes in form of soup, this sunchoke soup. We had this the first time last year in November in a restaurant as a part of a 8 course menu. I loved everything we ate that evening but the soup was my absolute number one. I liked it so much that I immediately asked for the recipe. It wasn’t hard to get it as the chef is a good friend of ours and he was only too happy to recite the recipe to me. 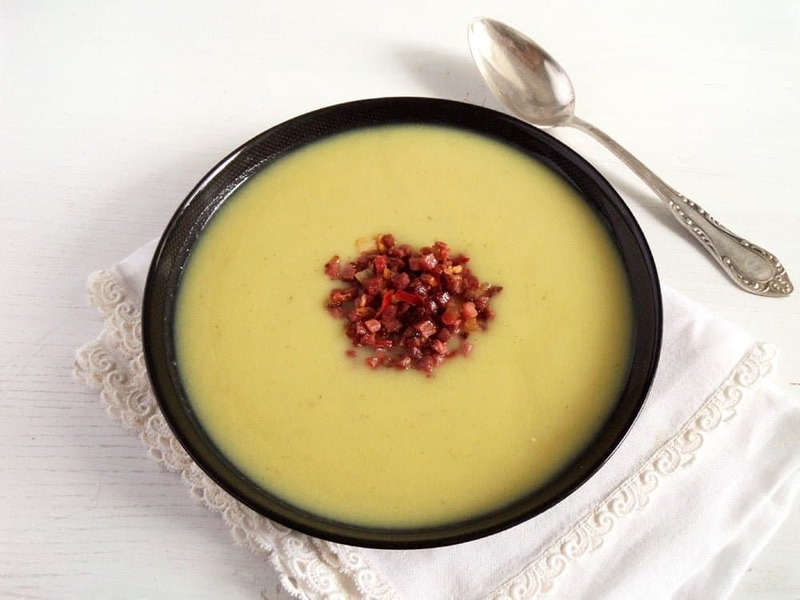 This recipe for Jerusalem artichoke soup and 2 or 3 more which were great as well. Since then I am making this soup each chance I get. 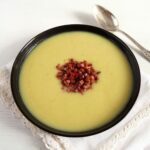 As it is the case with most soups, the recipe for this Jerusalem artichoke soup is very easy to cook. Start with cleaning your sunchokes very well, they are covered in dirt most of the times, especially if you have them directly from the garden. Peel and chop the Jerusalem artichokes into small cubes. Continue by cooking the sunchokes and the remaining cubed vegetables in some olive oil. Add the fennel seeds, I would definitely not leave them out, they just make this soup so much better, they give it such a wonderful flavor. Once the vegetables are soft, puree the soup. And while the Jerusalem artichoke soup is cooking make the bacon topping. The soup comes originally with a pork belly topping. I used lean bacon cubes instead of pork belly. Be careful when using Sambal Oelek, add a little at the beginning and more to taste. Sambal Oelek is hot and you want your bacon topping for the sunchoke soup to be hot, but you will not want to overdo it. I love the sunchoke soup with the topping, but when the topping is gone, I still eat the soup just as happily as before. So feel free to leave out the topping for a completely vegetarian meal. Or replace the bacon with some roasted sunflower seeds. And speaking about warming winter soups, I would like to use this occasion to talk about The Casual Veggie again. A few months ago I became a contributor for this cook book, which focuses on cooking with vegetables. There are 29 chapters in the book, each dedicated to a certain veggie, like cabbage or broccoli or even kohlrabi. The intention of the book is to make things easier for you when searching for a recipe for a certain kind of vegetable. 48 bloggers contributed to this book with their wonderful recipes. You will find links bringing you to their blog, and that will give you access to hundreds and hundreds more wonderful recipes. Some of these bloggers focus on paleo, vegan or gluten-free food, some are registered dieticians or nutrition coaches and some are like me: mothers trying to feed their children in the best possible way, bringing them up with a knowledge and fondness towards healthy, tasty and most of all real food. So in case you are still searching for the right present for a vegetarian or someone just loving veggies or trying to include more veggies into their diets, have a look at this e-book. It is something that would make any cook happy. Buying the book through my link will help support this blog and I already thank you for that. Clean and peel the sunchokes/Jerusalem artichokes, chop them into small cubes. Finely chop 1 onion, leek, celeriac and parsley root. Heat 2 tablespoons of the olive oil in a soup pot and cook the vegetables until golden and softer. Add the fennel seeds and cook for 1 or 2 minutes more. Add a dash of sake and the vegetable stock and cook until the vegetables are soft. Puree the soup and adjust the taste with salt, pepper and lemon juice. Add the lemon juice one tablespoon at the time and stop when you had enough. For the topping start by chopping the second onion and the ginger very finely. Chop the bacon into small cubes. Heat the third olive oil tablespoon in a pan and cook the onions until translucent. Add the bacon and the ginger and cook until the onions are soft and the bacon slightly crispy. Add Sambal Oelek to taste (it is very hot) and the pickled green peppercorns. Serve the soup with the topping and some bread. This looks incredible! I’ve never tried sunchoke. Love the idea of adding bacon on top! Thank you, Leigh. I only had sunchokes in form of a soup until now, I am waiting for the next occasion to try them roasted. This soup looks so smooth, creamy, and delicious! And since it is so healthy, I would not feel guilty helping myself to a nice helping of bacon on top. You will love the topping, Thao. Really spicy!!! i had my first sunchoke just last weekend and loved it! granted, it was fried, but i really liked the flavor of it. beautiful and nutritious soup, adina! Thank you, Grace. I really have to try sunchokes in another form as well. 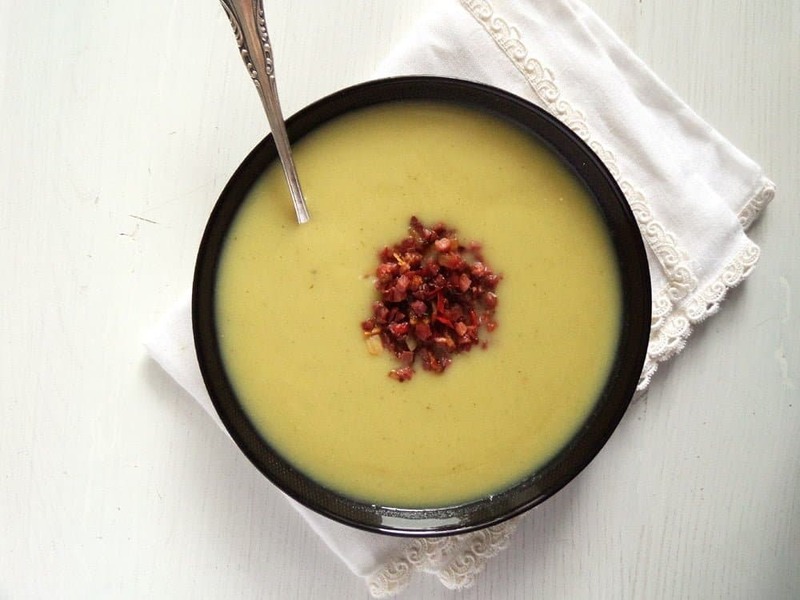 I love a creamy, hearty soup like this (I had a chestnut one tonight for dinner)…it’s so warming and satisfying. I need to look into sunchokes…I think I’ve had it at restaurants but can’t say I know much about it. Congrats on your cookbook contribution. Very exciting! Thank you, Monica. Chestnut soup sound great, I have never had that before, they are so darn expensive the chestnuts. Sorry, Anna. Since the last site update strange things are happening. Thank you for letting me know.